The pascom TAPI can be installed on any windows desktop. The TAPI client will then register itself with the server using the same credentials as the pascom Client, which means the TAPI is assigned to a user rather than being directly connected to a telephone. When a dial command is sent to pascom via TAPI, pascom will automatically select the current phone of the user and use this phone to make the call. If the user then changes their location or phone, the TAPI will not require any reconfiguration. The pascom TAPI functions independently of the pascom Desktop Client. When configuring or first using the TAPI interface, you will be asked for the to be used dial settings. However, phone number handling i.e. setting a 0 for outbound calls, international formatting etc etc. is done exclusively by the pascom phone system server, meaning the settings added in windows will be ignored. The arear code is a mandatory field. Enter your area code without the leading 0. All other fields should be left empty. System requirements: Windows 7 (32 and 64bit) or higher and Windows Server 2008 R2 (32 and 64bit) or higher. The most up-to-date patch levels must be installed. 2.Ensure that telephony services have been stopped. The current pascom TAPI client can be downloaded from the pascom Homepage. Administrative privileges are required to execute the setup on a Windows computer. From Windows Vista / 7 upwards, the system will automatically ask for the appropriate login. Start the setup procedure using the file you just downloaded, accept the terms and conditions and finally all the necessary components will be installed. You can now confirm the successful installation by clicking on Finish. Should you wish to install the TAPI on a Terminal Server or on a computer that is used by more than one person, then you will need assign the users, who will connect using the TAPI, with the xmpp.supervisor Role. This means that only one individual XMPP connection will be constructed from the Terminal Server, over which the total communication will be transmitted. The setup requires administrative rights for the corresponding server. From Windows Server 2008 onwards, the system will automatically ask for the appropriate login, however, if you are using Windows Server 2003 you will need to login using the appropriate identifier first. As stated before, the TAPI will login with the same user data just like the pascom Client. Should, at a later point in time, further users be assigned permissions or have permissions removed, permissions can be refreshed using the Control Panel > Phone and Modem > Advanced and then double clicking “pascom TAPI Service Provider”. To do this, the Supervisor User must login again. Start Outlook and select the desired contact entry. 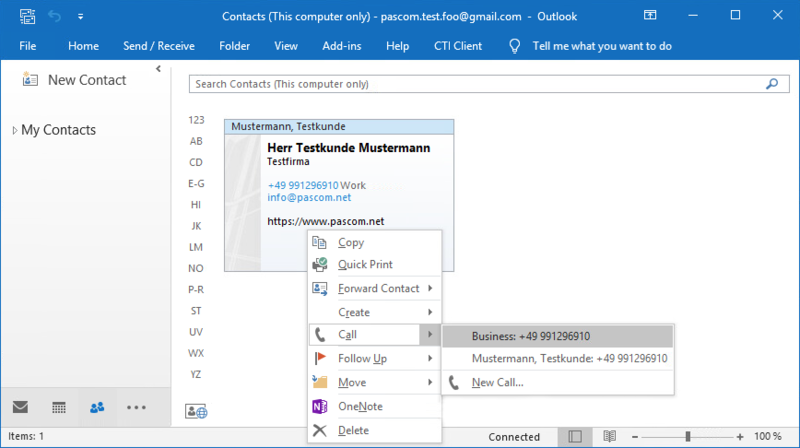 In order to be able to use the call function, in Outlook go to My Contacts and then select either the view: Business Cards, Cards, Phone or List. pascom telephony is not supported under the “People” view. Now your telephone should make the call. On terminal server installations, every user must select their “own” line within the TAPI Software (e.g. MS Outlook), before they will be able to complete a call using their phone. If the TAPI user has the xmpp.supervisor Role, all available users will be automatically selected and will then be available within the TAPI application. If you uncover a problem when using the TAPI Driver, you can use this manual to start a TRACE, which can then be analyzed by pascom and helping in finding a solution. Please note: Should programme behaviour change as a result of the Line Watch tool, then complete the debugging without it. In order to be able to record Debug Output, the debug version of the pascom driver must be installed. Whether you have the productive or debug version installed can be easily identified using the configurations dialog. Should you still not be certain, then please close all programmes and run the setup again. Please take note of the installation notices and during the installation select, “Debug” and confirm this by clicking next. Start the DebugView.exe with Administrator Privileges by right clicking and selecting Run as Administrator. Under the “Capture” menu, please check the “Capture Global Win32” option. If you did not run the programme as an administrator, a error message will appear. Next, start your TAPI software and follow those steps which lead to the problem. In the DebugView window, a whole range of tasks should be visible. As long as you start or receive a call information should also appear in Line Watcher. Once the test is finished, save both trace outputs from both applications (DebugView and LineWatcher). You can now send both files to pascom for analysis.